It was my children’s first day back to school after a holiday break. The school bus was due to pull up to the corner in four minutes. My daughters were doing their last minute gathering of shoes, water bottles, lunches, and backpacks. “Don’t forget it’s Tuesday,” I called to my eight-year-old daughter as she headed for the boots lying next to the door. “Tennis shoes for P.E.,” I added. I thought those responses. I thought them all. But I didn’t say them. Because as I was thinking about all things I wanted to say, I gave myself a three-second preview of what those responses would do for the situation. From past experiences, I could envision how this situation would play out if I chose sarcasm, hostility, and annoyance over empathy, responsiveness, and respect. Choosing hostility in a moment of conflict had once resulted in smashing my husband’s coffee pot in the kitchen sink. Choosing malice in a moment of conflict had once caused me to squeal my tires in a gravel parking lot. Outrage was the reason I lost all control one day when I was unable to locate my car in a sea of vehicles. Despite the years that have passed since those incidents, I can still see my children’s faces, staring at me in horror wondering what had become of me in those moments. Overreaction is what had become of me. It became my middle name. And regret was right there beside it. Regret follows on the heels of overreaction every single time. I detested myself in those moments. I wanted to run away and hide. But most of all, I didn’t want to be that volatile person anymore. Regret can be a powerful motivator. How did I begin to choose calm over crazed … reasonable over senseless … composed over fuming? One of my strategies was making a conscious effort to spot the “flowers” instead of the “weeds” in situations and in people. Another tactic was adopting a mantra to silence my inner bully. Whenever a critical thought came to mind, I silenced it with the phrase, “Only Love Today.” And another tactic was to envision my angry words like a car crash, inflicting damage to the person on the receiving end. All of this led to giving myself a 3-second pause to preview how a situation would play out if I chose controlling hostility over peaceful compassion. So there I was, standing in the kitchen on a recent morning, facing one of those fragile situations. I knew my response could either make or break the situation. And something told me that dismissing my daughter’s pain would cause things to quickly deteriorate. So I took a three-second pause before opening my mouth. And that’s where the real beauty happened. While taking that pause, I noticed there were real tears welling in my daughter’s eyes … real tears she didn’t want to fall … real tears she was actually pushing back with her fingers. That 3-second pause was just long enough for me to realize this sadness, this pain, this worry of my child’s was real. And a note to the P.E. teacher was very important to her. Grabbing a notepad out of the junk drawer, I scribbled a quick note to the P.E. teacher and handed it to my child. I never knew I had the power to hand someone a little bit of peace … a tiny corner of comfort … a permission slip to regain composure … but now I do. My compassionate reaction to my child’s situation held the power to save a morning, to save a heart from worry. “Thank you, Mama,” she said quietly. I actually saw the color coming back to her face. I thought of my child’s sore arm throughout the day. I knew our conversation could have easily gone another way. And although I don’t always make the right choice with my words, I knew I had that time. Regret was not my companion that day. “How did P.E. go?” I asked my daughter when she got home from school. “Well, when I got to P.E., I saw they were doing something I could do, even with a sore arm. So I tucked the note in my pocket and played,” she told me. There was a time in my life when I wouldn’t have given my child that note. My response to her 6:55 a.m. request would have been underlined with control, exasperation, anger, and insensitivity. We probably wouldn’t have made it to the bus, and, most likely, we would have parted on bad terms. She probably wouldn’t have had the opportunity to make her own good choice in P.E. that day. There would have been no winners in that battle. Thank goodness, things are different now. I now know every challenging situation does not have to be a contest to be right … to “win” … to have things go the way I want them to go. The goal of each situation is to speak in a way I can be heard … to listen in a way that the other person can be heard … and to walk away feeling at peace with the way the situation was handled. Regret, it’s nice to see you go. My list of overreactions is long and it is ugly, but today matters more than yesterday. I’ve started a new a list—a list of compassionate responses that I’ve offered. This list inspired me to write a hopeful reminder—a reminder that 3-second pauses have the power to save a morning, spare some pain, and prevent regret from being a lifelong companion. May it bring someone else hope too. I am my response to my child’s mismatched outfit and the crumpled report card at the bottom of her backpack. I am my response to my spouse who returned from the store without toilet paper but remembered the tailgate snacks. I am my response to my anxious parent who repeats the same worries and insists on giving me coupons I do not need. I am my response to my colleague with sad eyes and frequent absences. I am my response to my fifteen-minutes-late hairdresser with a sick child. I am my response to my neighbor with heart-heavy problems and little family support. I am my response to the irate driver who cut me off and made an obscene gesture in front of my children. I am my response to the waitress who got my order wrong. I am my response to myself when I forgot the one thing I most needed to do today. I am my response to spilled coffee, long lines, and middle-of-the-night wake ups. My responses are not perfect … they are not always ideal … I am human after all. Because my responses are more than just words. That could mean more than words. Can you think of a time when taking a quick pause, and a deep breath, saved you from overreacting and responding to a situation inappropriately? Author Bio: Rachel Macy Stafford is a certified special education teacher and New York Times bestselling author of Hands Free Mama. Her latest book, Hands Free Life, is for anyone who would like to stop managing life and start living it with more presence, peace, and human connection. Rachel founded handsfreemama.com and The Hands Free Revolution to help people grasp the moments that matter despite societal distractions and everyday pressures. This post is an excellent contribution to a site that has gradually changed my life. Honestly, not pausing and not mindfully controlling my emotions is precisely what led me to a brutal divorce five years ago. 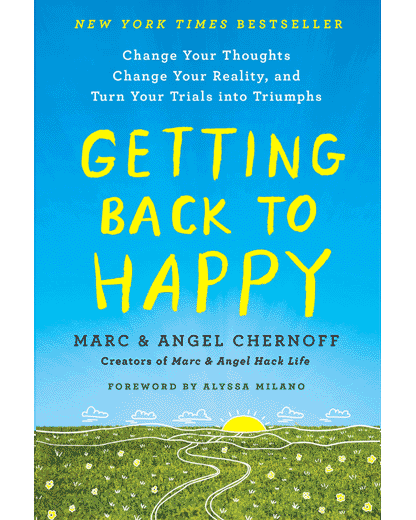 It was a shortly thereafter that I found this blog, and subscribed to the M&A emails, and eventually enrolled in the “getting back to happy” course and coaching. Although I still have some regrets about how I once behaved, I know I have changed and grown dramatically over the past five years. I am undoubtedly more tempered in my reactions and more loving and patient with those around me — and my relationships and personal growth have drastically benefitted from this approach to life. Yes, Ladies, I am a member of the same grateful group of subscribers to the daily blog. Though I still struggle, thanks to M&A, I am more aware of my reactions to daily situations. Thanks Marc & Angel, for sharing your thoughts & teaching me how to live a healthier, happier life! I can relate deeply with this post. And so I paused, and changed myself. My fiancé and I are mature adults, meaning we are over 65,. We do not agree on how to treat his or my adult children. Meaning I don’t approve in the way he indulges his children. I speak my opinion often and today’s blog made me stop and think about how it may be affecting our relationship. Then I just read the quote from Angel and realized where the problem lies. Thank you all. Love this blog. Shows you can teach an old dog new tricks. While I am not a parent, I can definitely relate to overreacting to certain situations, or, on the flip side, having someone overreact towards me (which is a terrible feeling). If more people can take those few seconds to pause and try to see what is happening from the other person’s point of view, like you were able to do with your daughter, the world would be a lot more positive place. Great thoughts on this – something I will try to be more conscious of myself. I read one blog and subscribed to the e-mail. I have a quick temper and have lived my entire 60+ years with regrets. I have tried counseling several times, but I have never successfully changed my behavior. I am hoping I can use these suggestions to make permanent behavioral changes. I know my temper is the reason I also have low self-esteem, so any improvement will be welcomed by me and all who know me. I believe this blog is an answer to prayer. What about at work where people do not speak gracefully or try to understand the way you are doing is trying to help everyone? Where everyone is trying to take advantage of you and get you to do things that is not in your scope of work. If we respond with love, but people are taking advantage of you? I’m a recovering “overreactor” and I am always filled with regret whenever I relapse into this very bad behaviour. I’ve just discovered this site and in just a few days of binge reading, i have learnt so much. What a wondeful article! Thank You. This post brought tears to my eyes. I’ve been there so many times in almost identical situations…running late to work and one of my kids needs something done. How many times did exasperation come out like a volcanic eruption? Countless. In fact, my responses have nearly always become anger, exasperation or a lecture towards my children-particularly towards my middle child who tests me on a regular basis. I’m exhausted. I work 50-60 hour week as a teacher, then come home to housework and 3 kids. I hate my responses when I am stressed. I hate that I am more impatient with my kids on work days. I hate that I have little time to sit and enjoy their wonderful company unless it is a holiday. I have to be a mum and a dad to them and maybe a part of me resents that. After all, who signs up for a marriage where you have to do the lion’s share? No one. Reading this article has shown me that I can make changes. I don’t have to react that way. Lately, I’ve been wanting to make changes. I recently wrote two lengthy letters to their teachers in the morning (as I am about to leave the house) for two of my children. I just thought I’d rather be late even with the pressures of work than have my children not feel I am not there for them when THEY NEED ME. It made such a difference to them and I felt better about myself. I just went to your website, Rachel, because your article stuck a chord on so many levels. Reading about your background, I might as well have been reading about me. I am the perfectionist, the over worked over-committer, the one with the endless to do lists. My mind is full of endless tasks and worries that need my attention. This all has consequences. Those words are so powerful…how tragically true this is. People say the same thing to me as you had once experienced. They wonder how I manage it all. The irony is they think it’s effortless. Deep down I know it takes everything out of me or I don’t do some things very well- quite often what matters. Reading about the journey you decided to go on has given me hope. There is still time for me to make changes before it’s too late. Before I lose my children’s childhood. Thank you, Marc and Angel, for including this article from Rachel. Thank you Rachel, for speaking from the heart about your experiences. This is a tough one for me. I have paused so often, walked away, said something kind only for the person to pick & pick until they hurt me. Sometimes a quick sharp response will help them to retract the mean stick. Took one too many beatings in my lifetime I guess. Beautifully said and I am going to do my very best to employ these strategies. Today matters. What an utterly BRILLIANT piece – thank you. I needed it SO badly to deal with an impossible teen daughter. I am often, often ashamed of my responses. But once at a restaurant (just to show I’m not all bad!) A waiter, obviously new or jittery (or nothing in particular) dropped a glass of water with lots of ice all over me. I don’t know why but I didn’t react or get angry. I just said, “Things happen” and I dried what I could. So, no regrets!!! It wouldn’t have helped to get cross – he didn’t do it on purpose. Due to me being hardheaded and exasperated , I would have prevented a major argument with my girlfriend and because of my reaction and failing to take the 3-second pause , she has ignored my texts and phone calls and that hurts . Taking a deep breath and considering situation from all angles has really helped me in my response to family, friends, colleagues and even strangers with the understand that I can control their attitude and words but am in control of mine. Just today, I went out to buy my tobacco and decided to give myself a day off from cooking my lunch and eat out in an affordable Chinese restaurant on the way back home. That’s a treat, as I am not really financially capable of eating out. It was still early and I was the only guest in the restaurant. From the start, the waitress chose to capitalise on my pro-activeness. But I was still fine with getting the menu, when she wasn’t reacting (as quickly as I’d like to). Unfortunately, I forgot my light at home and had no way of lighting my cigarette, so I asked her if she had matches. She declined (which was obviously impossible or hardly credible that they had no matches in the kitchen, stoves being mostly gas around here). So I went out into the rain, leaving my umbrella behind on a chair, to a nearby shop, got my matches and smoked my before-meal cigarette. I also mouthed my regular complaint about my people being habitually unkind (“Kindness is free, but you still cannot afford it!”). Loud enough for the waitress to hear it. As I sat down, looking at the falling rain, I realised that the only thing I can do in this situation is too offer her the small tip I intended, despite her hitherto misdemeanour. As she was bringing me the fish, her tone has already altered to a nicer nice. The fish was quite delicious and I was happy to have made the uneasy choice of spending my money on a restaurant meal, figuring out the costs of such a meal were I to prepare it myself. And I did as I decided, but also refreshed and satisfied by the meal. So I tipped her presumptuousness (as I saw it) and we parted on rather good terms. “Good bye,” we said, sure to see each other in some future time. Ironically enough, I would like to point out to you that it is bad form to correct someone’s behaviour. Your “Kindness is free…” quote, to your “…habitually unkind people” that you say on a “regular” basis? Piotr, I mean this in the most sincere and kindest way possible – did you ever consider that you are receiving back from the universe what you project? If you find yourself having to regularly criticize people’s lack of kindness…perhaps…you play some part in their attitude to you? We never know what is truly going on in someone’s life. I find it best to give everyone the benefit of the doubt, think the best of them. I think you’ll be much happier if you adopt the attitude of love to all. It’s so much easier, less exhausting, than constantly trying to make assumptions about others. And p.s., always tip servers as generously as possible. They depend upon their tips for their livelihood. Yes, I can relate to this post. I hurt people with my words when I’m annoyed with them or if I feel like I’ve been hurt. I regret a lot of it, and as I get older, I’m trying to change. Thanks for this wonderful blog. Kristy, I love that you recognized me just by my words! What a compliment! Thank you for being such a beautiful supporter in my life! Everytime when I have something going on that bothers me I receive M&A’s email about that situation. It’s so weird. So this morning I didn’t hold myself back. I was yelling and blaming my mom about everything. Each and everyday I am miserable about work my job my room everything you can imagine. I blame it all on her. Ofcourse I regret all the fighting but I feel as though she has cause all those misery, because you are what you create and unfortunately I have been held back from living my dream and lifestyle I hope for each and everyday. It’s hard to pause and think about your reactions and kind words you will say and I truly admire those who do. I feel a ton of remorse and regret and it’s all bottle up inside. Wish there was a way I could take it all back. But there isn’t because words hurt and make an impact on a persons life. I have experienced it first hand when I been in several abusive relationship. It’s a feeling of agony. So today my goal is to apologize and think twice before I say anything and hope that I can work on this ill behavior that we have. What courage it takes to share the dark side of being human. I too have struggled with my inner bully for decades with a long list of regrets. I just recently realized that I needed to stop the voice in my head that had no patients or compassion for myself. Since I’ve begun my quest to be kind and loving to me I’ve become my own best friend, so to speak, and I have begun to heal my inner wounds from years of regret. Peace has finally found me, and as a result, I like myself and I feel light hearted again which reflects on how I treat others. Thank you for sharing, it’s a great way to start my day. What a great post! I come from a family of over reactors, and I’m not proud of many moments in my life. When I can remember to take those breaths and assess a situation before reacting, I’m always happier with the results. I’ve taken a flame thrower to work relationships and walked out the door with a flourish on more than one occasion. It makes good theater, but not good life. Drama, I have learned, should be left on the stage. Thanks again for a wonderful sign post on the road of my life! I have made a mess of my life and some significant relations due to lack of impulse control and over-reaction. The need to be ‘right’ has spoiled many a relations in efforts to ‘correct’ them. All I need is to read this great piece everyday and use the message practically. I am indebted. Wish I had this to read when my children were younger (they are all now young adults who have flown the coop!) I would have posted it on my fridge as a reminder! Still good advice for anyone, but the morning children really hit a chord….thanks for the great post. Thanks for sharing this article. I am guilty of such behavior from time to time. Like how I treated our puppy when she’s misbehaving peeing all over the place in our apartment, getting sick and tired of training her to go on her training pads. ..shouting at her makes her go hide under the bed. Now I know better to be more understanding and to use kinder words that will help her learn what she has to do. I will share a copy of this article with my sister and fiance too. I’m sure it will be very helpful to them to learn to cope with everyday struggles and live a happier life with everyone around them. Thanks.😊. Thank you for this and all your inspired writings. It gives me comfort to know I am not alone with my regrets, and you have taught me well. I find it helpful to take this pause when I can’t find something. Instead of searching frantically, worrying I have lost my #whatever forever, I take a cleansing breath. It is amazing how many times I find it right where I thought it was or walk right to it. What? Thanks again from a big fan of your newsletters. Yes, a short pause and a mindful reaction to things can actually bring the joy back to all the faces involved. It was a great thing you did for your daughter. Imagined you had screamed at her, not only would she have probably cried and felt bad but she wouldn’t even partake in P.E. It only took 3 seconds to start this positive chain of reaction. I’ll remember this every time I feel like losing control. Thank you, Rachel, so much for sharing this. I have been reading your articles on an off over the last few years. They always seem to find me at the perfect place. I’ve begun sharing them around the office for our “Wellness Minute”. I really appreciate your honesty and openness. We are so lucky to have people like you in the world to share wisdom and the message of love. That was awesome and very engaging ! Thank you for sharing. Thank you Angel, for being just that: an Angel. Wise advice. I know this is going to be a much better way to respond to things with both my daughter and my husband. I wish this was a mainstream idea. Too often the harsh is what comes first. Then I am able to see why I am thankful. I may be thankful for them allowing me to react in kindness and grace. I am thankful to them nonetheless. Then I am filled with gratitude and not regret. Keep the awesomeness coming. Thank you! It never ceases to amaze me when I am grasping with something that I’ll read a Marc and Angel email and it’s as if it was directed just to me. I wonder “How did they know? !” Over reactions and regrets have been my nemesis. I actually moved from my small community for a brief period of time because of all the regrets I had created during a very challenging time in my life. It was a self exile of sorts to enable me to wipe my slate clean. Now 2 years later I have returned to my home to find my friends welcoming me with open arms and hearts. “I am my response” is something I will own indefinitely. Thank you for this very timely reminder. A great reminder to me for unexpected situations. Years ago on my hour plus commute I used to lose my temper and say not nice things, though only to myself, at rude drivers, but then I realized it was me I was hurting by letting them ruin my day, so I started to say a prayer instead, even for the driver who just put my life at risk, thinking that he/ she must be struggling to behave that way, and somehow that relieved my anger and desire to retaliate. What a great and powerful message. Beautifully said! I couldn’t help but feel guilty for doing the same to my kids and others. Thank you for the awareness. Compassion brings us so much more peace. Thank you. Such a good article. I will pay attention to my responses to make sure they are the me I want to be. This was beautiful. Regrets…..so many of them, so painful all because I didn’t pause. I live with bipolar disorder and this sometimes makes me impulsive and I don’t always make the best decisions. I don’t think it’s all that, but it’s there and I can’t change it, all I can do is try to remember to pause. I so appreciate your story and wish I had heard your words when my children were young. But I can pause now, and in the future. This is an important habit to build. Thank you again for the reminder. I had to deal a person who was very difficult to work with. For whatever reason, she was always trying to make herself look good, and make me look incompetent. The nicer I was to her, the more hateful she was to me. After a particularly exhausting day, she sent me a very insulting e-mail. Luckily it was by e-mail and not in person as my first reaction was to blow my stack. I started an e-mail to tell her off, but stopped short of hitting the send button. Instead, I sent her an e-mail expressing thanks for helping our customer, and copied her manager and mine. That short pause resulted in me getting praise from my manager, and eventually even a positive acknowledgement from her. Our working relationship improved, though it was never great. I have often thought about how much more miserable it would have been to deal with her if I had hit the send button on my original e-mail. Just what my weary heart needed today……and every day. Thank you for being there in this moment when I needed you. I am 30 years old and always knew my way to respond to things, only with my loved ones, was volatile. Now, I recently lost a good boyfriend, a partner who repeatedly told me he could not handle a relationship with someone who “fights” as much as I do. I regret all of it, all the times I could have taken a deep breath and I feel terrible because I have failed myself. I know one day I will meet someone who can help me calm down but I also need to do a lot of work to not be impulsive. I want to be more mindful and hope to God to be a better person for when I am married with children. Very nicely put. I do not believe we “are” who we can be but we “are” those actions in the minds of others involved. I agree with the pause. I am not only practicing that but also practicing the act of quick conflict resolution (if applicable) because, for me, I can tend to pause so long that I don’t confront a problem or issue that I feel. Like everything else in life, it is a balance. Thank you for writing about how you met the needs of your daughter through loving, action-based support and tellings us about the powerful win-win results of that day. Uplifting and positive encouragement to treat others as we wish to be treated. It’s an ongoing work for me. I have been recently blessed with the arrival of my first grandchild. It provided an opportunity to really reflect on how I parented the first time around and how I’d like to do better this time. One change I really want to make is the one you’ve addressed here. This was perfect! And I’m so thankful that I ran across this article/post today. It came at just the right moment in my life! Lately I have been reflecting on my words just spoken, and I feel crummy (regret) for having reacted and/or responded to my husband or my child the way I did. I need to practice the 3 second pause and remember that I am my response. Thank you for writing and sharing this. What a great post at an even greater time; i’ve been dealing with anger issues a lot lately; it seems like small things annoy me way more than they used to And i am more reactive rather than responsive. I always regret it afterwards When i’ve lost my temper And hurt the people around me with my words. Again And again i tell myself that ‘from now on i will not get mad’, but of course i never stick to that solution. I will really make an effort to be more mindful of myself BEFORE i respond. People say that words don’t hurt but i KNOW they do. Maybe it’s not so much About the words themselves but rather how they make you FEEL. 3 seconds can seem a long pause When you are angry And want to blurt out all those nasty words but if i take the pause i know that most of those words i don’t even want to say anymore. Have a nice (And peaceful) weekend. Wow! This was just what I needed to hear today. I will apply it. I write to you from South Africa, where this morning I had the same situation. My son has been off sick for a week and his Geography project is due today. He told me he would get a demerit and go on daily report. So my response to him was ” oh well, we haven’t done one of those before”. Usually I scream and shout but I need to learn to breath! Thank you for your lovely article. I am clearly not alone. As some one had already mentioned, marc and angel do seem to have a crystal ball of knowing whats worrying me at this moment. Thank you both for sharing such an excellent article on your blog.